October, as usual, proved to be a very busy month, and November is starting out the same. I’m not complaining, but it’s left me with little time to keep up on writing and sharing the minutia of my life. First, let’s backtrack all the way back to my birthday dinner. This year was one of the best yet, not only for the quality of the food, but because it provided Mike with a whole new level of challenge. I opted for a strip steak (quality ribeyes not being available). The challenge for Mike was that it was to be sous-vide. As expected, he met the challenge, successfully made a sous-vide machine, and we feasted on some of the best, and most accurately cooked, medium rare steaks ever tasted. I should add that after we removed the steaks from their bags, we used our handy blowtorch to fire the sides of the steak, giving it the needed grilled char. Thanks Mike! I have no idea what is in store for next year. The rest of the month included Mike’s birthday, which he intentionally keeps low key (which continues to befuddle me). Then it was prepping for a camping trip. Earlier this week, Mike and I returned from said camping trip at the Stephen C. Foster State Park in the Okeefenokee Swamp. It was a short, but wonderful journey. I highly recommend going – if you can find it. It is extremely remote. GPS doesn’t work so well out in the swamplands. Learn to read maps, kids. It may be your only back up. The wildlife was in abundance, but bugs at a minimum since it was cooler. It struck me at some point on the trip that the last time we camped in a swamp (Big Cypress, Y2K New Years), we returned home and vowed to move south, which we then did. Having been living in the coastal south now for so long, I’m wise enough to know it is the bugs in the summer that would prevent me from running away to live in the swamps. I can say it has inspired me to pick up my mandolin again (it’s been an embarrassingly long time since I’ve bothered with it). The reality is that I can’t bring my bass rig to a campsite. Well, at least not without a ridiculous amount of effort. New strings are on their way. The highlight of the trip was our self-navigated boat trip into the swamp. Feel free to check out our pics from that boat trip. We journeyed about ten miles in, in one direction. It was pretty intense at times with the waterway being only slighter larger than our low riding john boat and alligators on all sides, who like to plunge into the water at the boat as you near them. I wish we were able to take more photos of the birds, but they were so fast. The large birds were in abundance, though – storks, cranes, herons, hawks. Overall, a fantastic trip, and one I would like to make again, maybe next fall. Upon my return to civilization, I did what any modern American would do, and checked my email. In the three days I was away, Facebook had emailed me six times to let me know that it had been awhile since I last logged in and there were notifications and messages waiting for me. Twice a day for three days? Really, Facebook? Holy crap, kick it down a notch you needy baby. Of course, I’ve turned this into an experiment and have not logged into FB for over a week. I’m still getting about two messages a day. I assume eventually FB will start threatening to leave me, or suspend me, or whatever is the equivalent of a person-needy social media website break up. I won’t let it get that far. I won’t be able to resist cross-posting this very post to my wall. FB will be pleased it has lured me back. Unfortunately, I now have to go through the bother of figuring out FB’s intentionally confusing preference settings in order to not receive anymore of these notifications. I do refuse to be harassed by a bot. Next up, Thanksgiving prep. The grandest meal of the year. Planning begins next week. Does anyone have any idea what this thing is? It’s lit up at night and dark during the day. I am 99% sure it is in Lithuania, likely Vilnius. I’ve been watching it for almost 24 hours (no not straight) and can’t figure it out, but I find it enchanting. Addendum: Mike found it. It’s an outdoor pottery display in Vilnius, Lithuania. Neat-o. Good morning beachcombers. After 11 straight weeks, I’ve become slightly burned out on postcards. Because it is a feature I really enjoy doing, I thought now would be a healthy time to take a week or two off. So, no postcards today. Enjoy your time at home. I’ll be making yet another attempt to get to the beach (I have been thwarted from doing so a number of times this year). Wish me luck. Happy Sunday. A day late and likely more than a few dollars short, we find ourselves for this week’s Postcard in Myanmar’s capital city, Yangon, aka Rangoon (and Myanmar is aka Burma, fyi – keep up, the names don’t get any easier to remember). It’s fitting that I’m stuck on where to begin discussing our travels in Yangon. A dilemma of balance seems fitting for a country with a deep Buddhist ancestry. On one hand, Yangon offers up some of the world’s most exquisite architectural sites. On the other it is home to an oppresive military dictatorship. Which path to travel first? Let’s start down the dark path so we may leave in the light. No travels to Yangon can be made without turing our attention to the plight of Nobel Prize winner, Aung San Suu Kyi. Her story has fascinated me for years. I hope she has an opportunity to see her homeland free. Talk of an “escape city” for the generals has spread throughout Yangon. The plan was apparently reinforced by the US-led invasion of Iraq in 2003, which heightened the junta’s fears of attack by the United States, analysts say. Some observers believe the generals think the United States could invade by sea, which would put Yangon — a port on the Andaman Sea — and all the top command on the front line. I won’t be the one to break it to these folks that they don’t have anything worth offending for. The dark path of Burma continues as I learned about the travel ban debate surrounding this nation. Land of the Golden Temples provides a good summary of what is at issue. Since we’re only virtually traveling and none of our money is landing in the pockets of the government, I think we’re cool if we continue on. To the galleries now, beachcombers. The brighter path of Rangoon brings us to some of the world’s most detailed pagodas (payas). Worldsiround and Wit VerHoogt’s Individual Travel in Burma are good places to start. A number of professional and semi-professional photographers have been enchanted by Yangon. Goto Osami does a magnificent job of capturing Yangon in his three galleries, one, two, three. Mike Rogero provides us with a look at Rangoon’s people, be sure to read his commentary for useful and relevant information. Alfred Molon rounds out the general sightseeing with his extensive overall gallery. Alfred Molon also does us the favor of photographing some of Burma’s cuisine, Burmese Food. Who’s not hungry after viewing that? Also of miscellaneous interest are the 12 Month’s Festivals celebrated throughout the year. It’s time to leave Yangon. Before we do, however, we must stop at the Mother Land (2) for some Engrish fun. Now, we are proud to say that after the 5 years in services, we can fulfill our dream of “100% Guest Satisfactory”. Happy holidays, beachcombers! Lots of festivities abound so I’m shorting you guys on a super-groovy postcard, while still providing the illusion I spent a great deal of time on it. Four years ago this weekend, Mike and I kissed living in Illinois goodbye and we settled here in the Coastal Empire. Since that time, I have declared myself the best unofficial tour guide in Savannah, so please allow me to show you around my adopted hometown. Get your ‘to -go’ cup ready, we have a lot of walking to do. Much of what I will share with you is an amalgamation of things Mike or I have written at other times about Savannah, so no kvetching about a lack of originality if you’ve seen this before. I really shouldn’t be in front of this computer anyway on a gorgeous day like today. Savannah, Georgia is on the southeast coast of the United States. The heart of Savannah, the Historic District , is 18 miles west of the Atlantic ocean. We are situated on a 40 foot bluff on the southside of the Savannah River. The best of all galleries is ours, of course, Mike and Jaime’s Photo Gallery. Savannah was chartered as the first city of the colony of Georgia in 1732. James Oglethorpe established it with the approval of the British crown as a colony for debtors to go to escape prison (much like Australia). It also served as an outpost to protect the larger city to the north, Charleston, from Spanish Florida. We have a number of historic forts in the area including Fort Pulaski, Fort McAllister and Old Fort Jackson. Virtual tours of each are provided by Quantum Tour. These historic forts have battle reenactments and cannon and firearms demonstrations during most of the year. Savannah is the first “planned” city in the US; Oglethorpe was the designer. We have 24 squares that are placed in a symmetrical grid throughout the city, which is likely the reason I love it so. Chicago is on a grid, too. Cities on grids are just so logical. Savannah’s squares are a mix of lush tropical gardens and ancient live oak trees covered with Spanish moss (the spooky stuff of haunted movies). Check out this map of downtown Savannah to get an idea of the planning. Also, please check out this link for another photo tour of Savannah. The city has the largest historic district in the United States. Many of the houses and buildings look very much like they did when they were originally built. Much of the preservation can be accredited to the Historic Savannah Foundation and the Savannah College of Art and Design (SCAD). After World War II, a number of landmarks were destroyed in the name of “progress.” A group of local ladies joined together, as the Historic Savannah Foundation, in 1955 to work to protect the buildings. They had the foresight to use Savannah’s historical charm as part of tourism promotions. Their efforts worked and little by little, parts of the city have been declared protected by the National Historic Registry and tourism has become our strongest industry. SCAD came along in the late 1970′s. The school has been responsible for the restoration of a great number of the buildings downtown. Some of the old guard (a/k/a “NOGS” – North of Gaston Street – the really old district) bristled at the idea of an art college, or more specifically, art students and all their eccentricities moving into the “Belle of the South.” Most have come to accept and even respect the hard work (and the LOADS of money) the college has put into this city. Many new renovation projects are in the works. You can walk around anywhere downtown and will be guaranteed to see a zoning meeting notice regarding the restoration of a building. The city has VERY STRICT zoning requirements because of the historical preservation. Meetings must be had regarding nearly every change. When a live oak tree must be cut down or even trimmed, a notice is hanged on or near the tree regarding a meeting to be held to determine the tree’s future…I kid you not. Savannah also seems to be home of perputual building projects – such as the Bryan Street Bank Building and the Jepson Center for the Arts. I am honestly beginning to wonder if the construction on these two are ever going to end. The scaffolding has been up ever since I have moved here, and are frankly, making this gorgeous city look hideous. I consider both to be embarrassments. One secret of Savannah that you will never learn on tourism websites or brochures is our penchant for eccentric people. I think this may be characteristic of many warm cities (like Key West and New Orleans), but we seem to have a large number of very harmless but very weird people. We have “Particle Man,” a large balding white man with very long dreadlocks, who walks around moving his fingers about as if he were conducting an orchestra. Word has it, he is “counting his particles.” I have not asked him about it. Lately, Mike and I have seen him with a trollish looking woman. I’m not being mean, she really does look like one of those troll dolls. Everybody loves somebody sometimes. Another of Savannah’s eccentrics is the “Happy Tooter,” or as I later learned the cops call him “Johnny Two Notes.” This guy plays his saxophone in Johnson Square or on River Street for hours. Problem is, he doesn’t know how to play many songs. His repertoire consists of the National Anthem, Georgia on my Mind, Yankee Doodle, and When the Saints go Marching In. He plays all of those terribly. Savannah also has a large number of homeless people that live in Chippewa Square. They all look like ex-hippies who don’t know what to do now that Jerry Garcia is gone. They are a very nice bunch and are always sure to greet you in the morning. The only weirdo that may trouble you is “Forty-One Cents Guy” (whom I’ve not seen in quite awhile). This guy goes around asking tourists if they have forty-one cents. He always uses this specific amount because he has found people cough up the money more often than when asked, “got some change?” As soon as he gets the money, he goes to Wet Willie’s on River Street and gets a “to-go” cup. I could fill another page talking about all the people who carry signs and placards around town, too. The most notable of these sign-carrying characters is “stop the lies” guy. I have searched for information on him but I can’t find any. Eh, another day, then, beachcombers. Savannah has served as the backdrop to a number of movies. Mike put together a list of movies filmed in Savannah: Savannah Movie List – which is really odd considering we rarely watch movies. Two great spots to visit if you want to venture outside the historic district are the Savannah National Wildlife Refuge and Tybee Island. If you head out to the wildlife refuge, be warned that there are no barriers between you and the wildlife. The refuge is home to thousands of aligators. While this makes for some incredible photography, it also requires you to be very alert. Tybee Island is our local beach. Unlike so many American oceanfronts, Tybee retains a charming, residential atmosphere, rather than the obnoxiously commercialized feel you get in places like Myrtle Beach and Hilton Head. Sometimes, I am still in awe that I live 15 miles from the ocean. There are times I can stand on my front porch and feel the wind roll in from the east and smell the salt air and marshes, and hear that wind rustle my palm. Seafood is cheaper than beef and you can buy it fresh off trucks. This is home now. Please come visit, I love to show this place off. Dobry den, beachcombers. Today’s Postcard finds us in Košice, Košice, Slovakia. Košice is the capital city of the ‘kraj’ (region/district) by the same name. It is the second largest city in the Slovak Republic. The city’s name is pronounced Ko-SHEETS-seh for those of us not up on our Slovak. This lovely old berg of 250,000 or so inhabitants is nestled in the far eastern part of the Slovak Republic. It lies in the Košice basin, in the valley of the Hornad River. To the north are the the Cierna Hora mountains and to the west of Košice are the the Volovske Vrchy Hills. Košice dates back to the 13th century. Kosice.sk provides a consice history of the region. Košice is a really tiny place and it shouldn’t take us too long to see most of the sites. Maureen Mikovics Pulignano offers a lovely general gallery of photos. There are also some delightful photos in the Albis Photo-Gallery, although I find it unfortunate none of the photos were labelled. Both Kosicke.d42 and Kosice.sk offer informational tours of Košice’s historical monuments. Far and away, Julius Silver provides the most thorough gallery. For more a detailed tour, Kosice.sk created this one of St. Elizabeth’s Cathedral. I also found this page dedicated to Urban’s Tower. Yes, the site is entirely in Slovak. Just click a picture and stare. Then say, ‘ooh’ and ‘ahh.’ Move along. Repeat. That’s all you need to do. That’s how these tours work. Plus, it’s easy to do in Košice, because the architecture is stunning. A number of websites offer authentic Slovakian recipes including George Dolnak’s The Recipes of Slovakia Remembered, Slovakia.org’s Recipe Guide, University of Pittsburgh’s Slovak Recipes, and The Slovac-American Cultural Society of the Midwest’s Food From The Best Cook – Our Mothers. Good heavy eats. Hope you’re up for a little sauerkraut. Like many cities of the former Soviet republics, Košice is still adjusting to a more free market society. Unemployment is high, around 15%. Yet, the workforce is highly educated and with Slovakia’s admission to the EU, the future looks bright. Oddly enough, US Steel is the largest employer in Košice. They seem to recognize their role as a local corporate giant and give back to the area in the way of organized events and regional development. There is a lot of potential in this city. This visit to Košice has been short but pleasant. I’ll warn you in advance that next week’s trip may not be all that glamorous. I will be preparing the polls for the America’s Debate Year in Review, 2004-2005, which puts Postcards in the backseat. Anyway, this trip to Košice has been enchanting. Thank you to our kind webhosts. See? I told ya this week’s trip location wouldn’t start with the letter C.
Picking a country of origin from my visitors’ logs seemed to work last week, so I did it again for this postcard. Today we are traveling to the southern most region oAfrica – Cape Town, South Africa. * We’ll explore the city and parts of the outlying West Cape province. Like the demanding coast that gives rise to the many legends of the Cape of Good Hope, it seems Cape Town itself is a place one should get used to slowly and probably not go into unfamiliar waters. Cape Town is a city of contrast. It is home to great wealth and extreme poverty, soaring mountains and beaches, blacks, whites and coloureds (As an American, I feel weird typing that but apparently this is still common in South Africa). Let’s start off with some general galleries that capture most of the city-proper and touristy ‘must see’ places. We have Georgia Roessler’s Cape Town Gallery, Emily Delmont’s Cape Town Gallery, and Pat McKune’s Cape Town Galleries – all very good at displaying the popular locales. Cape Town is also home to the lovely Kirstenbosch National Botanical Garden. Of course, we couldn’t visit Cape Town without a ride down to Cape Point. As I was exploring, I noticed the touristy galleries were all rather similar. It seemed like very few capturing ‘day in the life’ type pictures. I then stumbled upon this site My Mother Built This House, Lifeonline. More specifically, this bit of information, “Nearly one-third of Cape Town’s population of three million live in slums or squatter settlements.” Oh, I thought meekly as I sat in my comfy leather chair, in my air-conditioned room, typing on my specially purchased ultra-quiet keyboard – at least we have an explanation for the tourist gallery similarities. This is when the contrasts of Cape Town really began to show themselves. I am not the only person to notice these contrasts. They are manifest themselves more once you begin to look. Manfred Leiter noticed. So did the folks at the Southern Africa Environment Project. Cape Town offers a great deal of luxury to those who can afford it. We see this in Craig Sydney’s Cape Town Buildings and the voluminous websites dedicated to luxury rentals. This isn’t how many Cape Towners live, however. One third of those who live in Cape Town and the outlying West Cape area do so in extreme poverty. When I mentioned earlier that we may not want to explore unfamiliar waters, it is because of galleries like Marcel Baumann’s Cape Town and Janet Walt’s Trek Earth Gallery and articles like this from the BBC, SA housing protests turn violent. Then there is the ravishing of the poor community by HIV and AIDS. Personal stories of these (mostly) Cape Towners from the Wola Nani Embrace are certain to anger and disgust. Now I understand why so many tourist maps exclude anything on the outer edges of Cape Town. This portion of the trip could get real depressing if I went on, so we’ll just leave it here for now. There are a few more miscellaneous stops to make before we go. I have no way of putting these in any semblance of order, so random it is. First, a (white) local’s look at his homeland after having been away for awhile brought to us by Dr. Gernot Hassenpflug. I confess I really enjoyed his gallery because he took lots of pictures of his meals. I couldn’t find many Cape Town specific recipes, but this more than covers the food portion of our trip. Also, while we are in Cape Town, we are going to want to pick up a little slang. The South African Expat’s Slang Page is a good start. Very befok. Check, China? This trip also proved to be immensely useful in that I learned the Dutch word for beachcomber – strandloper. The term as it is used in reference to Cape Town is detailed by M.L. Wilson of the South African Museum in his (her?) Shell middens and Strandlopers. As the story goes Jan van Hunks, a pirate in the early 18th century, retired from his eventful life at sea to live on the slopes of Devil’s Peak. He spent his days sitting on the mountain smoking weed on his pipe. One day a stranger approached and asked to borrow some spliff. After a bit of bragging, a smoking contest ensued which lasted for days. Van Hunks finally defeated the stoned stranger – who unfortunately turned out to be the devil – and they both vanished in a puff of cannabis smoke. 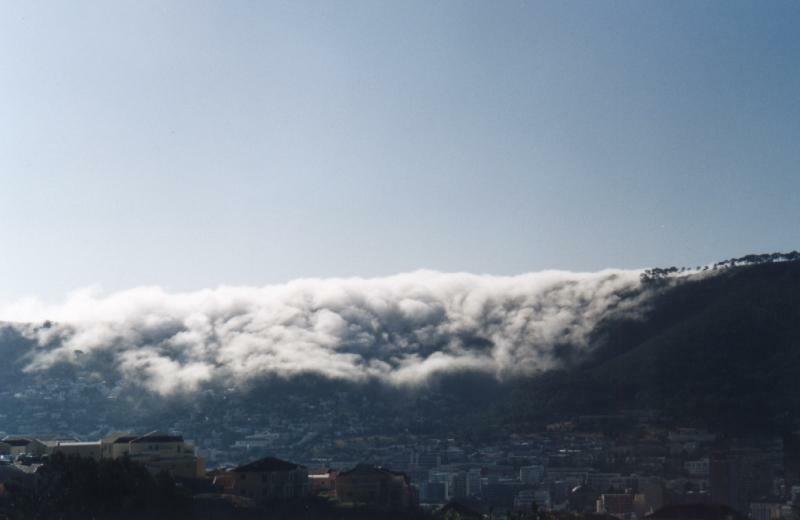 Legend has it that the cloud of “tobacco” smoke they left became the “table-cloth” – the famous white cloud that spills over Table Mountain when the south-easter blows in summer. Thank you for joining me on this trip to Cape Town. It has been a learning experience. See you next week, strandlopers. Sala kahle! *As an aside, I realized this week that a disproportionate number of my Sunday Postcards are dedicated to cities or counties starting with the letter C. Well, C is for cookie afterall. I must have some underlying holdovers from youth I’ve not fully explored. I really do like cookies. A lot. Mmmm…cookies… In any event, I promise that no matter where we go next week, it won’t start with the letter C.
Happy Sunday, beachcombers. Tonight’s Sunday Postcard is inspired by The Gull Reef Club’s visitors logs. I saw someone visited here from a country called the Cocos (Keeling) Islands. Despite fancying myself as a amateur geography buff, I had never heard of this place before. I will use this postcard to return the visit and learn a little something while I am at it. The Cocos Islands are one of the Indian Ocean’s best kept secrets. 27 tiny islands make up this territory of Australia. These maps will help orient you to the atolls. According to this site Cocos Tourism – the islands didn’t even exist when our last postcard, the Roman Ruins, were at the height of their civilization. In fact, there were no inhabitants until the 1820′s. The people maintain residences on only two of the islands – Home Island and West Island, with a total around 600+ people living there. In the last week I spent finding resources on the Cocos Islands I think I’ve seen just about all there is to see. This place is so incredibly tiny. The 27 islands make up a total of 14sq kilometers. There are only 15 kilometers worth of roads. There is one landing strip and two planes that arrive in and out of the Cocos Islands every week. There are two schools to educate about 150 students. If you are looking for a paradise in the middle of nowhere, this is it. There are a few very nice galleries that will help you get an idea of what the area looks like. First we have some photos of the lucky Karen Willshaw, a citizen of The Cocos Islands: Ikan Images. Next, Windsurfing in Western Australia brings us on a nice little tour. CR-Photo, a German website, has a nice gallery also. The Australian government has a mediocre gallery (the pics are a bit small for my liking) featuring the everyday life on the Cocos Islands. The best gallery I found is that of Jonas Lorch. He has the most complete Cocos Islands online photo gallery. If you visit the Cocos Islands, it seems there are two ‘must do’ activities. One is to go scuba diving in their abundant coral reefs. Cocos Dive hosts a stunning gallery of life under the sea around the atolls. Another activity that shouldn’t be missed while visiting the Cocos Islands is a guided tour of the Pulu Keeling National Park. Home to an abundant ecosystem of rare vegetation and animal species, the park is only accessible by boat (and even then you have to swim in the last few meters). Once you’ve covered these spots, had supper with one of the local supper clubs, and slept on the beach a few days, you’ve done just about everything there is to do on the Cocos Islands. Of course, setting this pattern on repeat for a few weeks could prove to be quite therapeutic. I reluctantly pack up to leave the Cocos Islands. I had no idea what to expect when I first ran across the name of this wee territory in my visitors logs. This trip has been a delight. Thanks to my anonymous visitor from the Cocos Islands for the inspiration. Good day, beachcombers. Welcome to this week’s Sunday postcard. By request of Ms. Flynny, we are travelling to Rome to visit the classical monuments and architecture symbolic of one of the greatest civilizations of the past. Unlike some of the other places we’ve visited, there is no lack of photo galleries of Roman ruins. A good place to start is Alan Zeleznikar’s Rome Travel Page. Scroll down to the green ‘Rome’ section. Mr. Zeleznikar has done a very thorough job of detailing what a tourist to Rome’s ruins can expect. A trip to Rome to see the ruins would not be complete without visiting certain, quintessential landmarks, most of which are mapped out in this useful Ruins Map. While we could probably spend weeks on the details and minutia, we’re going to stick to the most popular and well-known spots for this postcard. One of the most-known of the most-known spots, of course, is the Roman Coliseum. Professor Felix Just of Loyola Marymont University offers us a nice gallery of the Roman Coliseum. He also hosts a gallery for one of the other most-known of the most-known spots, the Roman Forum. Virtual Tours of Architecture provides a great tour of the Pantheon. We start, logically, by seeing the beauty of the Pantheon’s exterior. The Pantheon’s interior is equally spectacular. Other locations that we can not miss while we are touring ancient Rome are the Mausoleum of Augustus, courtesy of Yong-Ling Ow, the Theater of Marcellus, brought to us by the University at Buffalo, and of course, Circus Maximus, gallery courtesy of Virtual Travels. The University of Buffalo also offers this fabulous gallery featuring the Arch of Titus – a gallery I sought out especially for Titus (who needs to get around to blogging more). While it is a bit slow to load, Druid’s Den brings us 3-D panoramic tours of the Coliseum, the Pantheon, the Spanish Steps (not ancient, just old), Palazzo della Civilta, Piazza Navona, Piazza Farnese, Trevi Fountain, and Parliament. Next stop on our ancient Rome tour are the Baths of Caracalla, gallery courtesy of the University of California San Francisco. UCSF not only offers great images of the Baths, they also provide a detailed description of a typical day at the Baths for your average Roman. Do any resorts exist like these today? I would sure love a day at a place like the Baths of Caracalla. We’re about to wrap this trip up, but not before visiting the Trevi Fountain. Adriolo.com’s nighttime gallery of the Fountain really captures the beauty of this ancient fixture. Legend says that we must face away from the fountain and toss a coin in or we will never return to Rome. So let’s toss our coins in to ensure we come back because I have really loved this tour. Thanks, Ms. Flynny, for suggesting it. This has been a lovely visit to ancient Rome. Until next week…ciao! Today we travel to the sleepy little farming district, Nickerie, on the Atlantic coast of western Suriname. Nickerie is partially bordered on the east by the Nickerie River and on the west by the Corantijn River. The Corantijn River also marks the far western border between Suriname and Guyana. Suriname is a former colony of the Netherlands. Suriname became independent from the Netherlands in 1975 and like many former colonies, there are some stability problems in its government. Suriname held a general election this week, Surinam election ends in deadlock. The article indicates that no party received a majority of the votes. This may be due to the fact that Suriname is an extremely diverse nation, ethnically and religiously. The election results may merely be reflecting the diversity of this nation, but I won’t pretend to know anything about Surinam’s political scene. Nieuw Nickerie is the capital of the district of Nickerie and the second biggest city in Suriname. It is a city on the run from the ocean. Nieuw Nickerie currently lies in its third location. The Nickerie River has claimed the first two homes of Nieuw Nickerie. The city was forced to move each time. Nieuw Nickerie is now protected by a sea wall in hopes to reduce the need for further city relocations. Nickerie’s claim to fame is its abundant rice plantations. There are also a number of banana and tobacco plantations as well. So like most farming areas around the world, there isn’t much going on around here. Marlon Romeo has put together an incredibly comprehensive look at Nickerie on his site, Nickerie on the Web (Click on the image to start your tour). Ok, so the page looks a little 1998. You think Mr. Romeo has broadband access, photoshop, dreamweaver or whatever else he’d need to make a 2005 looking site? Me neither. Mr. Romeo, you have done a fabulous job. If I ever come to your beloved Nickerie, I’m looking you up to be my tour guide. WunderPhotos has two decent pics of Nickerie, WunderPhotos. I also found this gallery that gives us a nice glimpse of Nieuw Nickerie, J. Willemsen’s Nieuw Nickerie Gallery. There are some striking similarities between Nieuw Nickerie and Savannah. The silty river water, the disheveled greenery, tin roofed shacks on stilts… Nieuw Nickerie seems laid back and sleepy. My kind of place. Egad. Get that water flowing people. No wonder every site I found about traveling to Suriname says you must get a malaria shot. No trip is complete without sampling the local fare, Recipes from the Surinam kitchen. Lots of seafood, curries and chilies. This is a diet I could get used to quickly. As with all of our Sunday Postcards this virtual trip must end. Don’t trade in your Euros yet, however. I received my first request for a virtual trip from Ms. Flynny. Next week, The Gull Reef Club Jet will be heading out to Italy in search of some Roman ruins. Nickerie, Suriname is a quiet farm district that seems to change as much as the tides. I have enjoyed the pleasant, humid haze of this trip. Vaarwel, Nickerie.